The ever changing La Caja Magica in Madrid lights up for the ATP Tour. 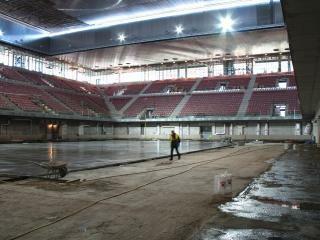 RADCON #7 application at the Magic Box tennis stadium in Madrid. La CajaMagica(the Magic Box), a brand new tennis stadium opened for the ATP tour in Madrid, is build from sustainable materials, promoting sustainable development in conjunction with one of Spain’s most popular sporting events. This constantly transforming structure, designed by the French architect Dominique Perrault, features a unique retractable roof that can be lifted like a lid, providing protection from the wind while still maintaining an outdoor event ambiance. The walls are constructed from metal casing, which protects the structure from the sun but allows the air to pass through. When lit at night it completely disappears revealing the interior of the building. RADCON #7 was applied to the €180 million project funded for the Olympic bids for 2012 and now 2016.